On the Bay offers three star rated bed and breakfast as well as self catering accommodation for business executives, tourists and holiday makers. 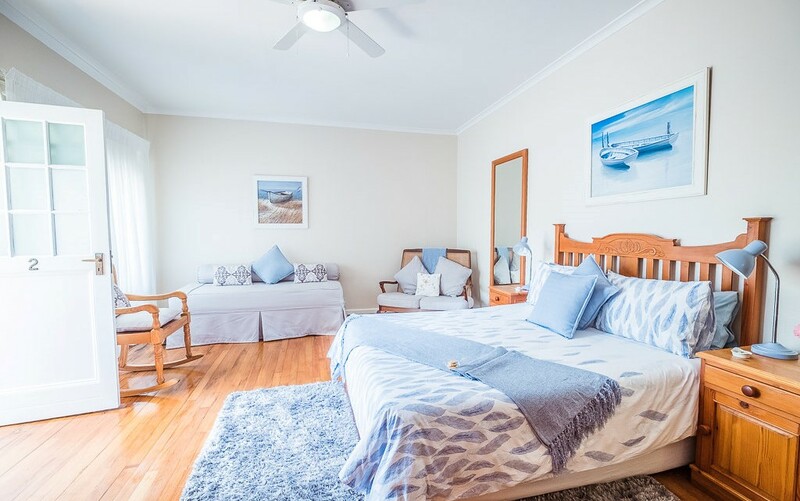 Our guesthouse is situated in Summerstrand, Port Elizabeth and within walking distance to the most popular beaches, restaurants, shopping centres, Boardwalk entertainment centre and main bus routes. Likewise a few minutes drive will take you to the airport, university, golf course and sports stadiums. We are well positioned for the new Sports stadium, Iron man and all major local and international sport events. This perfectly situated accommodation is able to offer easy access to all the above whilst still maintaining peaceful tranquility in the midst of our beautiful garden and the sound of the waves lapping on our sea shore. Follow the ‘Settlers Way' (M4) to ‘City' to ‘Summerstrand' signs. Stay on the M4 all the way to the beachfront even if the name changes from Summerstrand M4 to Humewood M4. Travel along the beachfront and turn right into 6 th Avenue, just after the Marine Hotel (Protea). On the Bay is just up the road across Margate Street and 6 th Avenue. Turn right into ‘Alister Miller'. At the traffic lights turn right and follow ‘La Roche' to the beachfront (McDonalds will be on the right hand side). Turn right and travel along the beachfront. Turn right into 6 th Avenue just after the Marine Hotel (Protea). On the Bay is just up the road across of Margate Street . “The River house” at Colchester is situated in the heart of the Sunshine Coast. On the one side you overlook the rolling hills and Southgate entrance of the Addo Elephant Park and on the other side the Sundays River and majestic dune fields. The Sundays River runs through the village of Colchester which is 25 minutes drive from Port Elizabeth. Jeffreys Bay, Cape St Francis, Kenton on Sea, Bushman’s River , Port Alfred, Tsitsikamma and even Plettenberg Bay are all close by, offering interesting day trips. The world famous game reserves of Addo, Shamwari, Schotia and Lalibella are all in close proximity.